2 bedroom apartment with a large balcony with superb view over the marina and the sea. Perfect location in the centre of Funchal right next to the Theatre, the Santa Catarina Park and Municipal Garden, the Ritz Cafe, Theatre Cafe and the Golden Gate Grand Cafe. Within 5 minutes from the Cathedral or Marina where most buses stop and the La Vie Shopping Centre that opens every day (with a 9h/24h pharmacy and a large supermarket Pingo Doce in the bottom floor). No car is necessary but if you rent one there is a private paid park in the building. The market is 15 minute walk. Small supermarket Spar in the building. I am a teacher, mother of two, and I live in Funchal, 10 minutes from this apartment. I hope you will feel at home in my light and comfortable apartment and that will you enjoy the beautiful Madeira. The apartment is spacious and comfortable ideally situated overlooking the harbour. The balcony is sunny with amazing views out to the sea, fabulous for watching all the cruise ships coming and going. It´s also close to so many attractions and just a short walk (10 mins) to the Old Town where all the restaurants are found. The bathrom has recently been restored and has a large walk in shower. Bath towels and beach towels provided. Liquid soap povided. Hairdryer supplied. Free cals for local numbers. Ceiling fan in one bedroom and other fans in the apartment. Electrical heather can be supplied if necessary. Parking in the building for free. The living/dining room is fitted with 3 pieces suite, and the sofa is a double bed, dining table with chairs, cableTV, DVD, free WiFi internet. A breakfast bar with 4 chairs. Large window with views over the sea and door opening onto the balcony. Basics as salt, pepper, spices, oil, sugar, water, coffee, tea, etc. With a breakfast bar open to the living/dining room. Newly renovated and fully equipped with stove, microwave, oven, fridge/freezer, washing machine, toaster, coffee maker, kettle, blender, iron and board and all the cutlery, etc. The living/dining room has windows with views over the Marina and the sea and a door accessing the large balcony. A large balcony with canopy where you can enjoy complete privacy and a great view of the sea with the cruise ships arriving and departing from the harbour. Perfect to enjoy alfresco dining. 5 minutes walk away from the Marina of Funchal and the harbour with lots of restaurants and excursions to see the dolphins and sometimes whales and turtles. 15 minutes by car to Palheiro Golf (an 18 hole, par 72 Cabel Robinson course) and 30 minutes to Santo da Serra Golf (an 27 hole, par 36+36+36 Robert Trent Jones course) or you might like to take a day trip to the nearby island of Porto Santo to try out the new course there (an 18 hole, par 72 Severiano Balesteros course). In all courses the view are stunning and the walk around the course challenging. People with mobility problems can access to the apartment. There is an elevator in the building. Notes on accommodation: A sofa bed is available in the living room making the total occupancy 5. Outside: A large balcony with canopy where you can enjoy complete privacy and a great view of the sea with the cruise ships arriving and departing from the harbour. Perfect to enjoy alfresco dining with a large table and wicker chairs. Also the perfect place to watch the fireworks every Saturdays in June in the balcony (as the fire works are at the sea) or on New Year´s Eve in the terrace of the building (as the fireworks are at the amphitheatre of Funchal). Elsa was the perfect host. Her apartment is beautiful and overlooks the harbor where you can see boats and cruise ships come and go. The apartment is very comfortable and well equipped. Best of all the apartment is very centrally located in the heart of the Funchal area. There are many shops and grocery stores near by. Also all of the city buses are in this area. Looking forward to staying here again in the future! Elsa was a great host and gave us all the low down of the area, which restaurants to visits, tours and nearest supermarket. She collected/returned us from the airport which made this such a stress free relaxing break. 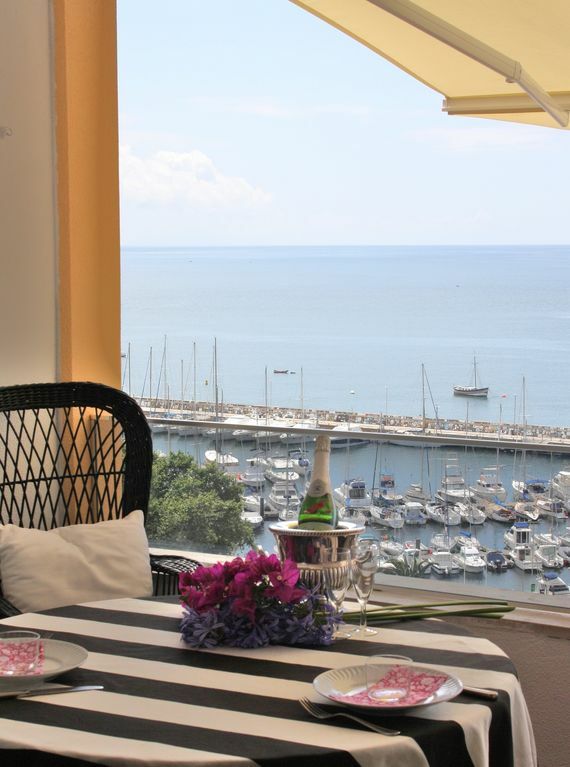 The apartment is very spacious, with a lovely balcony to enjoy the sea views and promonade. The location is spot on, with lots of nice restaurants and bars on your doorstep, but no noise disturbance being 7 floors up (with lift). I would really recommend this apartment and service provide by Elsa for a lovely stress free break, to enjoy the sight of Funchal and Madeira. Nous avons apprécié notre séjour dans l'appartement d'Elsa. Elle nous a très bien accueillies à notre arrivée dans la capitale et a été très disponible quand nous avions des questions. L'appartement est conforme aux photos : spacieux, propre, tout confort. Il est surtout idéalement placé : proche des commerces, des bus, de l'océan ! Nous avons passé une très belle semaine et avons adoré Madère ! Merci Marie pour ces mots très touchants. Je suis très heureux que vous ayez apprécié votre séjour dans mon appartement à Madère. Magnificent views over the marina. Could not have had a better view. Apartment well equipped and roomy. Home from home. Well positioned for bars, restaurants and shops. Pick up to and from airport was arranged.would certainly recommend and if back in Madeira would look no further. Thank you Elsa for a wonderful stay. Thank you Hazel for your nice review. I´m looking forward to your next stay. The previous reviews of this apartment are very accurate - we were guided by them in our selection of accommodation and were not disappointed in any way in our recent holiday. The apartment is not new, but it is very comfortable in every way [bed/ chairs/fans/kitchen facilities]: truly a home from home. The location is superb if you want to explore Funchal: buses are on the doorstep; there are restaurants galore within staggering distance; the supermarket is very close; the bakery across the road supplies lovely coffee, cakes and bread; two lovely gardens are within yards of the front door. We were so enthralled by the activities in the marina that we abandoned most of our plans for touring the hotspots and spent hours on the balcony watching the life of Funchal unfold before us. Elsa was everything one would wish for when booking an apartment: prompt to respond, helpful with the admin, very approachable and absolutely efficient in every aspect of our dealings with her. Thank you, Elsa. Tourism is the mainstay of Madeira's economy and what makes it such a special island to visit is the pride taken in all aspects of the tourism industry and the high level of skill shown by all who work in it: it truly is a little bit of paradise. Alas, our stay ended all too soon and we now only have photos to remind us of the sea by day and twinkling lights by night. The fact that this apartment is booked well in advance by happy returnees says it all - we will be joining the queue and hope to return. Restaurant tips: Tipografia/ Restaurante do Forte/ Armazen do Sal/ Boho are all within easy [flat!] walking distance and are excellent for both food and service; not the cheapest eateries but first- rate value for money. Some memorable meals were enjoyed! Thank you David for your fantastic review and also for the restaurants tips. I agree with you, they are all excelent restaurants. I´m very happy that you want to join the list of my regular guests ! You will always be welcome ! Once again we have had a magical holiday, Elsa your apartment is just beautiful to sit and watch the world go by. We wouldn't want to go anywhere else. It's like coming home each year. Looking forward to next year. Sue& Bill. Thank you Sue & Bill for your fantastic review ! You are welcome anytime ! 15 minutes walk away from Barreirinha Beach Complex that is located near the Old City and the Market. Other resorts as Clube de Turismo, Ponta Gorda Beach are 30 min walk away. Here you can access the sea, they have sun loungers, changing rooms and the water is crystal clear. Other Madeira beaches are all pebble, with the exception of a few which have black sand and a couple with golden sand (Calheta Beach and Machico Beach) which you can access by car in 30 minutes. Funchal airport is about 20 Km from the apartment. Travel time by car is approximately 20-25 minutes. It is not essential to hire a car as buses are frequent and cheap. Excursions are the best way to tour this beautiful island. Going out of town, the fishing village of Câmara de Lobos is about 15 minutes away. The Botanical Garden, Quinta Blandy/Palheiro Ferreiro, Monte Palace are a must for gardening enthusiasts. You are in the center of Funchal town, right next to the Theatre, the Santa Catarina Park, Municipal Garden and the Cathedral. Within 5 minutes walk from the Marina where most buses stop and the La Vie Shopping Centre with a 24h pharmacy and a large supermarket. 15 minutes far from the Market, the Old City, the Cable Car and Barreirinha Beach Complex by foot. 5 minutes from the Harbour with lots of restaurants and excursions. There are also many nice restaurants nearby: Celeiro, Combatentes, Sabores Alentejanos, etc. Madeira has the most fascinating walk-in Levadas which are the irrigation channels built back between 16th and 20th to bring water from the North to the South. Whale and dolphin spotting and marlin fishing. To discover Madeira at its best we supply you some guides for free. Notes on prices: Rate given is based on 2 people sharing. Extra persons €70/week or €15 per night if less than a week. 1st child under 12 years old at the time of check out free of charge, 2nd and 3rd child fifty percent discount. Please contact the owner for rates on long term lets or any specific requirements. Booking can be secured by email and confirmed on receipt of 30% deposit. Booking Notes: Minimum booking of 1 week (if less required, please contact us). Booking for 2 to 4 guests are welcome. Another person can stay in the sofa bed. Changeover Day:Arrivals and departures depending on other bookings can be flexible. Changeover days are also flexible.